The National Baseball Hall of Fame and Museum has announced four inductees for 2019, including the first to be elected by a unanimous vote of the Baseball Writers’ Association of America. The four latest inductees join two that were chosen in December by the 16-member Today’s Game Era Committee. Their picks were Harold Baines and Lee Smith. If you’re a diehard fan of any of these six players, you’re probably already thinking about how you’re going to get to the Sunday, July 21 induction ceremony. Sports Travel and Tours has got you covered, offering 10 different travel packages so you can customize your weekend to fit your budget, schedule and interests. Sports Travel and Tours’ selection of travel packages starts with the Induction Weekend – Base Hit package, and the nine other selections offer add-ons that enhance the experience of getting out to see these four 2019 inductees: Mariano Rivera, Major League Baseball’s all-time leader in saves, who was named on all 425 ballots cast in the 2019 Hall of Fame voting; pitchers Mike Mussina and the late Roy Halladay; and designated hitter / third baseman Edgar Martinez. Rivera, 49, spent all 19 of his major-league seasons with the New York Yankees. He played a key role in earning the team five World Series championships and set career records in saves and games finished. A 13-time All-Star, Rivera was the last player to wear uniform Number 42, which was retired in honor of Jackie Robinson in 1997. Mussina, 50, played 18 combined seasons with the Yankees and the Baltimore Orioles and finished with 270 wins and a .638 winning percentage. At 39, he became the oldest pitcher to record a 20-victory season for the first time. Halladay was killed piloting an aircraft in 2017 at the age of 40. He played for the Toronto Blue Jays and the Philadelphia Phillies. He will be the sixth player elected to the Baseball Hall of Fame posthumously. Among pitchers active since 1998, Halladay’s 67 complete games are the most in the majors, 13 more than runner-up Randy Johnson. Martinez, 56, won batting titles in 1992 and 1995 with the Seattle Mariners, the only team he played on for over 18 seasons. He ranks as the Mariners’ all-time leader in runs, runs batted in, doubles, walks, extra-base hits and total bases. Smith and Baines both debuted in Chicago during the 1980 season. Smith began with the Cubs and went on to record 478 saves while Baines started out with the White Sox and had 2,866 hits. Smith held the major league record for saves when he retired. Whether you’re a fan of one of these stellar players or you simply want to experience an induction ceremony, we have the trip for you. With the Base Hit package, guests arrive in Albany on Friday, July 19 for an evening trip reception at the Hampton Inn & Suites Albany-Downtown, where you will stay for two nights. Saturday’s festivities include watching the Ford C. Frick and J.G. Taylor Spink awards be presented at historic Doubleday Field, and watching the Parade of Legends make its way through downtown Cooperstown. See current Hall of Famers and the 2019 class of inductees in the flesh! This year’s award winners have already been announced, with Philadelphia native Jayson Stark earning the J.G. Taylor Spink Award for his contributions to baseball writing. Stark has covered sports for the Providence Journal, the Philadelphia Inquirer, ESPN, The Athletic, the MLB Network and Stadium TV. The 43rd Ford C. Frick Award is being given to Al Helfer, a mainstay in broadcast booths across the country for four decades and the play-by-play voice of Mutual’s Game of the Day. 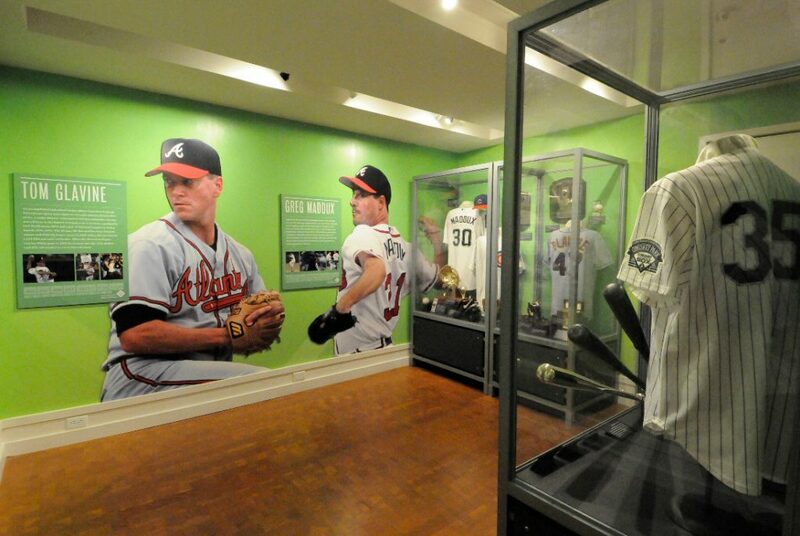 The travel package includes admission to the National Baseball Hall of Fame and Museum on both Saturday and Sunday. Learn about baseball’s past and beginnings through the museum’s three-story timeline that features just under 40,000 three-dimensional items, three million books and documents and 500,000 photographs. The museum’s Plaque Gallery serves as the centerpiece, commemorating the sport’s finest players, managers, umpires and executives. The induction ceremony will be held on Sunday, with sports fans gathering at the Clark Sports Center. It will be followed by a boxed lunch, and Sports Travel and Tours has daily breakfasts covered, too. As always, travel from the airport to the hotel and to all events is included, along with a Baseball Hall of Fame membership, a trip souvenir and 24-hour trip assistance. One of the optional trip add-ons is “Ump’s Eye View: An Inside Look into Baseball,” featuring retired major league umpire Al Clark. Hear about baseball’s behind-the-scenes world and ask questions during Al’s presentation at the Hall of Fame’s Bullpen Theater. Induction Weekend – Extra Innings, which adds another night’s hotel stay and admission to the Legends of the Game Roundtable, where the Hall of Fame’s new inductees will reminisce with fans at Doubleday Field. Induction Weekend – Bases Loaded, which has all the features of Induction Weekend – Extra Winnings, but with admission to Al’s “Ump’s Eve View” presentation factored in. Plus, guests receive upgraded seating at the induction ceremony, nestled in with the media, players’ families and major league VIPs. Induction Weekend – Infield, combining all the features of the Base Hit package but upgrading guests’ hotel accommodations to the Albany Marriott. This package also includes admission to “Ump’s Eye View” and upgraded induction ceremony seating. Induction Weekend – Home Run, which includes all the features of Infield while adding another night’s hotel stay and admission to the Legends of the Game Roundtable. Guests also receive a baseball signed by one member of the Hall of Fame’s incoming class. Induction Weekend – Grand Slam, which shifts the hotel once again, this time to the Courtyard by Marriott Oneonta Cooperstown Area (for a three-night stay). This package has a little bit of everything, building off the Base Hit package with admission to “Ump’s Eye View” and the Legends of the Game Roundtable, plus upgraded induction ceremony seating and a private program at the Baseball Hall of Fame called Artifact Spotlight, where guests can get an up-close look at artifacts not currently on display. Like in the Home Run package, guests get a signed baseball, too. Induction Weekend – Base Hit Casino, which—as the name implies—is equivalent to the Base Hit package but with accommodations at Turning Stone Resort and Casino in Verona, N.Y. Guests also receive a $40 free play coupon, per night, to be used at the casino. Induction Weekend – Extra Innings Casino, which adds in another night’s stay and admission to the Legends of the Game Roundtable onto the Base Hit Casino package. Induction Weekend – Infield Casino, adding upgraded induction ceremony seating onto the Base Hit Casino package. And lastly, Induction Plus, a six-day travel package that builds off of Base Hit (but offers different hotel accommodations) with admission to the Legends of the Game Roundtable and “Ump’s Eye View,” along with three days spent exploring New York City and enjoying two Yankees’ games. To learn more about Sports Travel and Tours’ induction weekend travel packages or to book a trip, call 800-662-4424.